Most affordable homes show other side of house boom. A humble road in central Kawerau has been revealed as a bargain hunter's dream, laying claim to the cheapest stretch of residential real estate anywhere in New Zealand. Tamarangi Drive in the Whakatane district boasts 43 properties with a median value of just $17,000 apiece - about the same price as a decent used car. The figure pales in comparison to the country's richest street - Herne Bay's Cremorne St, where the cul-de-sac's 12 lavish properties boast a median price tag of $6.175 million and are collectively worth nearly $90 million. An investor with enough cash to buy a standard Cremorne St home could instead pick up 363 average properties in Tamarangi Drive - if only more were available. Data compiled for the Herald by CoreLogic shows the nation's 10 least expensive streets are mostly located in economically depressed central North Island towns. Along with Kawerau, three of the bottom 10 are in Murupara, one in Tokoroa and two in Taumarunui. 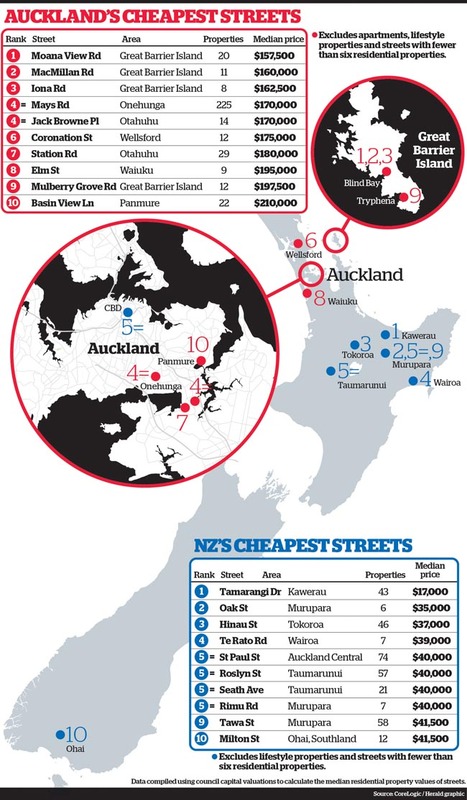 The only streets on the list from elsewhere in the country are Wairoa's Te Rato Rd, Central Auckland's St Paul St and Ohai's Milton St in Southland, where the median value of its 12 residential properties is just $41,500 - making it the priciest of our 10 cheapest streets. Tamarangi Drive is a tree-lined semi-commercial street featuring a church, thermal motel, Mongrel Mob gang pad and burned-down pub. The median price of its 43 residential properties is dragged down by three blocks of tiny one-bedroom units that cater for beneficiaries, pensioners and seasonal workers. One of the units, C2/1 Tamarangi Drive, is for sale with an asking price of $22,000. The one-bedroom "chalet" is described as "very tidy", with open plan living/kitchen plus separate shower and toilet. It rents for up to $100 a week but incurs a $31.50 weekly body corporate fee. Kawerau Harcourts agent Margaret Jensen said despite the bargain basement prices, she did not think the former single men's village units were a good bet for investors. "They're only 30sq m each and the body corporate fees are so high." Eighteen of the 39 flats were currently vacant. "They don't portray good investment at all." But she said the street was a pleasant drive to and from the Kawerau township. "It's tree-lined, and to try and beautify Kawerau the local council has put up a lot of huge street art." • Where are NZ's most deprived areas? • How affordable is your broadband? The town has suffered a series of tragedies and setbacks in recent years. Five young people aged 16 to 20 took their own lives in late 2010 and early 2011. In 2011 the Ministry of Education controversially unveiled plans to close Kawerau Intermediate and merge it with Kawerau College, though millions of dollars is now being poured into the new school. And Kawerau's principal employer, Norske Skog, announced it was drastically cutting capacity at the town's Tasman Mill in 2012, laying off staff and sending more workers to the dole queue. Neighbouring Murupara, which boasts three of the nation's cheapest streets, has also had its problems, making headlines for gang violence in recent years including two gang-related deaths. Oak St has six properties with a median value of $35,000, making it New Zealand's second cheapest street. Rimu Rd, eighth ($40,000), and Tawa St, ninth ($41,500), also feature in the bottom ten. Murupara Community Board chairman Jacob Te Kurapa said his own property had nearly halved in value from $120,000 to $65,000. Local people were losing equity in their homes, affecting their ability to borrow from banks. The town had suffered setbacks in the past and remained economically depressed with few jobs, he said. However, the cheap property was good for young families looking to get into their first home and could encourage newcomers and investors to the town, which was commuting distance from Rotorua, Whakatane and Tauranga, he said. CoreLogic research analyst Nick Goodall said the economic environment was not supporting smaller areas, which had less economic activity and lower volumes of property sales. Residents on the country's cheapest streets inhabited different worlds from those in our richest postcodes. "There is just such a big divide," said Mr Goodall. It boasts a $39 million mansion and is home to the country's richest street, but Auckland also offers surprise pockets of dirt cheap real estate. Great Barrier Island has four of the region's least expensive streets, according to data compiled by CoreLogic based on latest council revaluation figures. Moana View Rd is the cheapest of all. Its 20 residential properties recorded a median value of just $157,500 - four times less than last month's median sale price for the wider Auckland region. The island, 90km northeast of Auckland, also grabbed the second, third and eighth cheapest streets, all recording median values below $200,000. On the isthmus itself, Mays Rd in Onehunga is Auckland's least expensive. Its 225 properties are an apparent bargain with a median price of just $170,000, despite two of the street's homes tipping the $1 million mark. The Auckland list excludes apartments, which would otherwise dominate the list because they are so numerous in the central city. If apartments were included, St Paul St would be the cheapest with a median price of $40,000. Mays Rd resident Catherine Wallace, 71, was surprised that her street had come up as the cheapest in Auckland but it didn't bother her. The Onehunga street has a good mix of properties, with mainly commercial on one end and residential homes ranging from townhouses to units and state housing. Ms Wallace paid $430,000 for her three-bedroom unit in 2012, but the property was valued at $630,000 in the latest CV. "I don't think anyone's going to get anything for $170,000 around here, but if that's the median price then it's probably because it has been brought down by the older units and state home values," she said. "It really doesn't worry us because our house value is going up and our neighbours are of completely different nationalities ... they are wonderful and add a little flavour to the community." 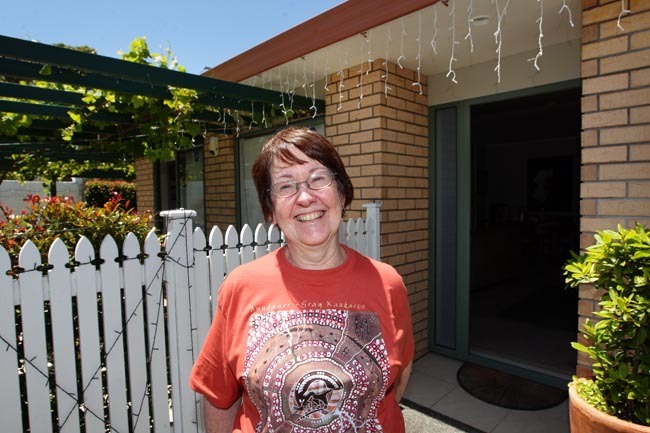 Ms Wallace said a neighbour paid around $500,000 for a house. Another resident, who did not want to be named, said leaky units were the main reason for the low median price. He said more than 50 units, built in 1999 to 2000, were identified as leaky and many had sold for under $100,000.